Nothing tastes better than something you have grown yourself. 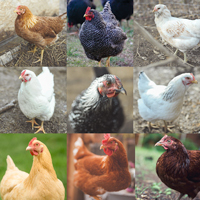 In this assortment for every 25 chicks ordered, you will receive 15 beautiful meat birds and 10 assorted females which will lay brown or white eggs. We will ship our broadbreasted Cornish X Rocks or Cornish Roasters for your meat birds (these could be all males - all females - or some of both) and the ten hens for laying will be from our Murrays Choice and Brown Egg Layer chicks. The meat birds will make nice fryers in 7 to 10 weeks and the hens will start giving you eggs in 18-20 weeks. For those of you who want a few eggs each day and some great tasting home grown chicken - order 25 or 50. For the more serious chicken fancier who either wants to make a little money on the side or endear themselves to the relatives or neighbors, try 75 or 100. These are not recommended for raising at an altitude of over 5,000 feet. 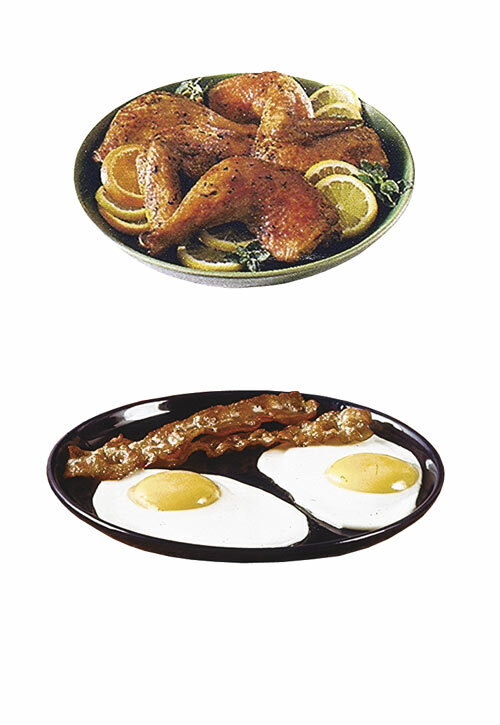 I want to purchase the meat-n-combo (25 birds). I was wondering if for the 10 hens for laying i can get only White Rocks? I live in Northern Michigan and it's pretty cold during winter time and i want eggs during that time also. Thank you ! Sorry, if you order the assortment package it is hatchery choice for what breeds you get. Your not able to specify. When purchasing the Meat-N-Egg Combo, the chicks are not marked (identified) in the shipping box. However, within a few days, it will be easily noticed which are the meat chicks by their size and growth. 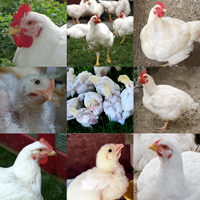 The meat chicks are ready for butcher by 6-8 weeks, so they grow very rapidly. When ordering meat and egg combo a total of 15 how many are meat and how many are layers? Very Pleased!We ordered the "Meat-n-Egg" combo (along with a few other "chosen by us"breeds) to be delivered the week of Memorial Day. The chicks arrived Thursday with only 1 DOA. We lost 3 more total during the first week, but all in all the chicks were very vigorous and hardy and rearing to go. The meat birds are already twice the size of the egg layers, so separating them out will be easy. 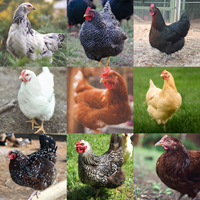 There is also a very good assortment of egg layers, and if we were able to pick the breeds by the chick pictures we will have a fine assortment of colors in both our chickens and the eggs they lay. 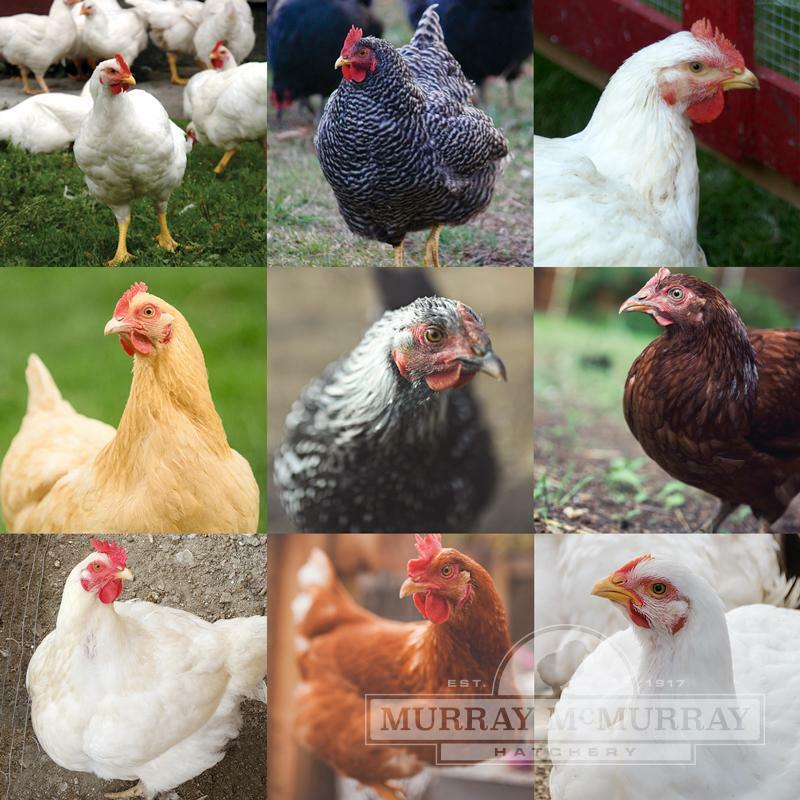 We have ordered from Murray McMurray in the past and they always have provided us with excellent poultry. disappointedWe were sent 27 chickens, 2 were dead on arrival, 3 died the next day. We had 16 meat birds, one got sick and died, the others needed to be treated. Of the ones that lived that weren't White Cornish Cross, we ended up with 2 roosters, a Golden Polish and Dark Cornish (these two don't lay yet, at 30 weeks). So at maturity, we only have 3 red stars who are laying regularly. I don't think this constitutes a "meat and EGGS" assortment!